The RIO Adventure™ RA-i700 centerfold table features an aluminum frame with a 48" x 24" melamine table top, heat-resistant up to 425°. As the name suggests, the RA-i700 quickly folds in half for easy storage. Features an integrated carry handle for easy transport and telescoping legs for height adjustment. Weighs 11 lbs. Supports 60 lbs. Measures 48" x 24" x 27" when open. Folds to 24" x 24" x 3". 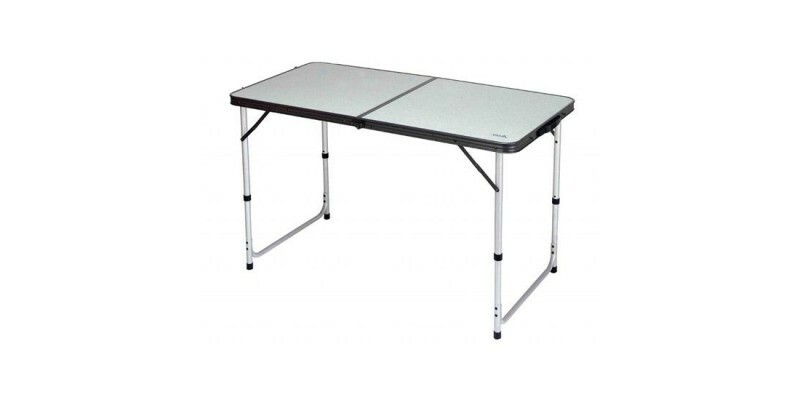 Ideal for camping, RV'ing, tailgating or anywhere tables are used. Table size 48" x 24"
Open size: 48" x 24" x 27"
Folded size: 24" x 24" x 3"